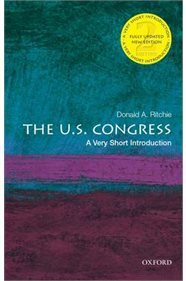 "In the second edition of The U.S. Congress, Donald A. Ritchie, a congressional historian for more than thirty years, takes readers on a fascinating, behind-the-scenes tour of Capitol Hill, pointing out the key players, explaining their behavior, and translating parliamentary language into plain English. No mere civics lesson, this eye-opening book provides an insider's perspective on Congress, matched with a professional historian's analytical insight. After a swift survey of the creation of Congress by the constitutional convention, he begins to unscrew the nuts and pull out the bolts. What is it like to campaign for Congress? To attract large donors? To enter either house with no seniority? He answers these questions and more, explaining committee assignments and committee work, the role of staffers and lobbyists, floor proceedings, parliamentary rules, and coalition building. Ritchie explores the great effort put into constituent service-as representatives and senators respond to requests from groups and individuals-as well as media relations and news coverage. He also explores how the grand concepts we all know from civics class-checks and balances, advise and consent, congressional oversight-work in practice in an age of strong presidents and a muscular Senate minority."